Guests of Hard Rock Cafe Antwerp can enjoy fresh, high-quality items from Hard Rock’s menu, including the fan-favorite Legendary Experience, featuring a mouth-watering selection of burgers. Hard Rock’s Smokehouse offerings utilize the very best Hickory wood chips to slowly cook its ribs, chicken and pork to juicy, tender perfection. 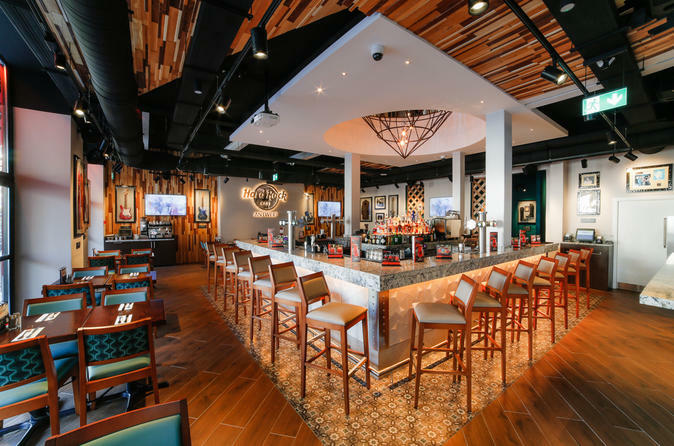 In addition to its food, Hard Rock Cafe’s extensive, award-winning drinks menu includes Hurricanes, Margaritas, signature favorites and Alternative Rock (alcohol-free) beverages, all available in Hard Rock’s souvenir, collectible glassware. The cafe offers a unique look at the history and future of music, with an entirely new memorabilia collection featuring items from legendary and contemporary musicians from around the world. Fans will be able to see Lady Gaga's dress that was designed right here in Antwerp by famed Belgian clothier Toon Geboers; white gloves worn on stage by Prince during his ‘Purple Rain’ tour in 1985 and items from Van Halen, Foo Fighters, and John Lennon just to name a few.